Vincent Kompany during his post-match interview claimed Manchester City ‘didn’t care’ about the hostile welcome their team bus received at Anfield last night. In fairness, it crossed the line – and the fans who threw bottles and other missiles let themselves down. Liverpool issued an apology, which Pep Guardiola accepted, but fair play to Kompany for downplaying the events. He did though claim that there would be a ‘little welcome of their own,’ for Liverpool’s coach next Tuesday, which made the internet die laughing. City have been struggling to sell out the Etihad for the game – and even Manchester United fans got involved to mock the threat – considering how feeble the Sky Blue support is. 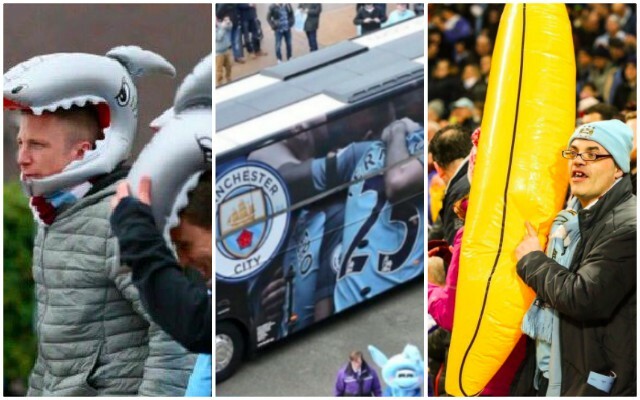 Inflatable sharks and bananas… Hopefully the Reds will be able to cope. Next week we'll be at home and we'll have our own little reception. It’s gna be full of reds you monster headed gimp.